Weaving and etching its way from the snowmelt of southern Colorado, the Rio Grande winds through the mountains and deserts of the Southwest, bringing life to an arid land before reaching the Gulf of Mexico. 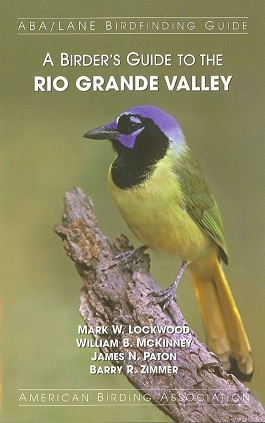 A Birder's Guide to the Rio Grande Valley is designed to help you locate not only the specialty birds of the Rio Grande Valley—those not occurring elsewhere in North America—but also to find the more common birds of the region. Birding begins in the wonderland of the Lower Rio Grande Valley, detailing routes designed to help you make the most of your visit at any time of year. The guide deviates from “the Valley” to cover the Edwards Plateau, the Davis Mountains, the Pecos Valley, and Guadalupe Mountains National Park. Special attention is given to the world-renowned regional hotspots: Santa Ana National Wildlife Refuge, Bentsen-Rio Grande Valley State Park, Big Bend National Park, the Davis Mountains, as well as the El Paso and Las Cruces, NM, areas. In addition to descriptions of over 230 birding sites, the authors—all of them long-time Texas birders—have completely updated the Annotated Checklist, covering more than 500 species. 327 pages.